Ordinaries and Extraordinaries: Up in the Old Hotel – The Bookshelf of Emily J.
I read this book because James Spader gave it to Jimmy Fallon for his birthday on The Tonight Show a few weeks ago. 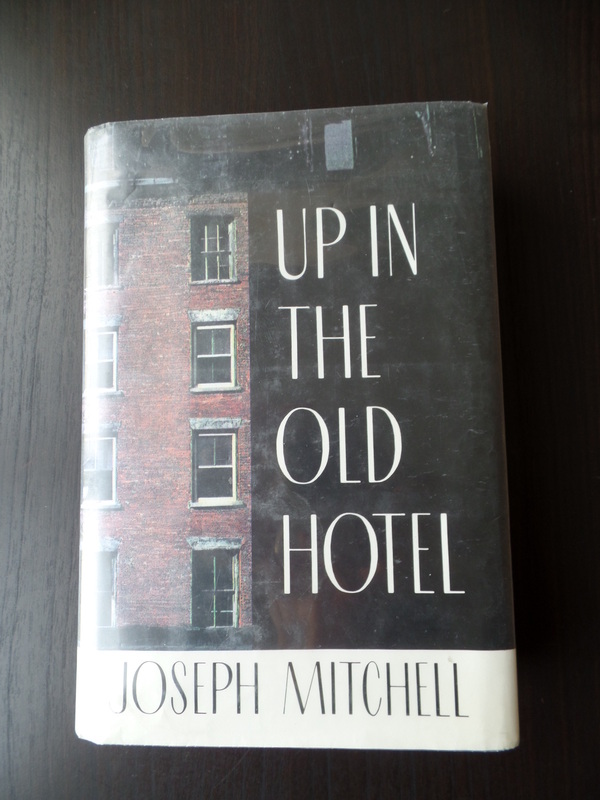 It’s Up in the Old Hotel and Other Stories by Joseph Mitchell. It is a compilation of Mitchell’s books, which are composed of essays he wrote for The New Yorker in the 1930s, 40s, and 50s. These essays are about the local New York color, and I loved every minute I spent reading this 718-page book. The books of Mitchell’s included in this compilation are McSorley’s Wonderful Saloon, Old Mr. Flood, The Bottom of the Harbor, and Joe Gould’s Secret. I feel less affectionate toward the two books in the middle, but McSorley’s Wonderful Saloon (and the title essay) and Joe Gould’s Secret were gripping. The other two books mostly made me hungry for some oysters on the half shell. One of the best quotes sums it up: “It isn’t easy to carry on a conversation while eating oyster stew” (p. 485). Joe Gould’s Secret is about, well, a big secret. Joe Gould is an eccentric bohemian writer that Mitchell interviewed and observed for a profile in The New Yorker. This profile appears in McSorley’s Wonderful Saloon. Gould claims to be writing a book called An Oral History of Our Time that is the longest book in the world. He hides notebooks all over the city (and in the countryside) containing his observations and writings. He gains some measure of fame and respect for this work, although he’s known to be a character. After Mitchell highlighted him in The New Yorker, Gould got more attention and even had a benefactress pay for his lodging for a while. However, after Gould dies, nobody can find his Oral History. A group of his friends and admirers search for it, but nobody ever finds it. It has never been found. This intrigued me, as the Oral History sounded fascinating. It could be an amazing look into the lives of ordinary people during the time of writing. Mitchell explains in this book why it has never been found. It was never written. This is a secret Mitchell kept until 1964. He didn’t want to take away Gould’s dignity and deflate him. Even when Gould died and others were looking for the composition notebooks of the Oral History, Mitchell kept up the façade. Mitchell’s writings about this incident and his interactions with Gould end Up in the Old Hotel on a mysterious and melancholy note. Mitchell mused, “Suppose he had written the Oral History, I reflected; it probably wouldn’t have been the great book he had gone up and down the highways and byways prophesying it would be at all—great books, even halfway great books, even good books, even halfway good books, being so exceedingly rare. It probably would have been, at best, only a curiosity. A few years after it came out, copies of it would have choked the ‘Curiosa’ shelves in every second-hand bookstore in the country. Anyway, I decided, if there was anything the human race had a sufficiency of, a sufficiency and a surfeit, it was books. When I thought of the cataracts of books, the Niagaras of books, the rushing rivers of books, the oceans of books, the tons and truckloads and trainloads of books that were pouring off the presses of the world at that moment, only a very few of which would be worth picking up and looking at, let alone reading, I began to feel that it was admirable that he hadn’t written it. One less book to clutter up the world, on less book to take up space and catch dust and go unread from bookstores to homes to second-hand bookstores and junk stores and thrift shops to still other homes ad infinitum” (p. 693). The first section of Up in the Old Hotel also had some interesting stories and characters. It is McSorley’s Wonderful Saloon, which comprises of profiles Mitchell wrote for The New Yorker and some of his fictional short stories. The New Yorker profiles were my favorite part of this. “The Old House at Home” is about McSorley’s Saloon and the changes it underwent over the course of several decades. He described its history as an ale house and how it changed once it allowed women to drink there. Its history is a microcosm of American history. Later on, in the essay “All You Can Hold for Five Bucks,” we learn, “Womenfolks didn’t know what a beefsteak was until they got the right to vote” (p. 291). I enjoyed other essays in the collection. There’s “Lady Olga,” about the famous bearded lady Jane Barnell. She explained the realities of life as a circus “freak” and told Mitchell that “she daydreams about becoming a stenographer the way some women daydream about Hollywood.” She wisely professed, “If the truth was known, we’re all freaks together” (p. 105). She’s right. “Evening with a Gifted Child” is about prodigy Philippa Duke Schuyler. I learned a lot about and the strangeness of life through the eyes of a child prodigy and her parents. These two essays reminded me of Andrew Solomon’s fascinating book about children with horizontal identities from their parents. I additionally learned a lot about Gypsies from some of the other essays. Apparently, Mitchell was on the board of directors for the Gypsy Lore Society. I also delved into what it is like to eat terrapin. “The meat came off the terrapins’ tiny bones with a touch of the spoon, and it tasted like delicate baby mushrooms” (p. 322). The Bottom of the Harbor, while giving me cravings for seafood, also includes some astute observations from the harbor men about environmental concerns. They lament the changes in their fishing grounds and oyster beds, noting that pollution has changed where people can get their food from the ocean. Mr. Poole said this: “Sometimes I’m walking along the street . . . and I wonder why the people don’t just stand still and throw their heads back and open their mouths and howl . . . [o]n account of the . . . craziness of everything” (p. 488). He’s concerned that the harbor will be ruined “with something a million times worse than pollution” (p. 488). I don’t think his concerns, printed in 1951, were that off. The most “chilling” essay from this collection is one called “The Rats on the Waterfront.” It is about the enormous rat population in New York City. When I visited New York City months ago, I saw a rat cross my path. In my naive tourist way, I laughed and felt that I’d had an “authentic” New York experience. Apparently, I had no idea. Mitchell writes about the millions of rats in the city and their habits, noting there are different kinds, both brown and black. Here’s what he wrote about these pests. “Away from their nests, they are usually on the edge of hysteria. They will bite babies (now and then, they bite one to death), and they will bit sleeping adults, but ordinarily they flee from people. If hemmed in, and sometimes if too suddenly come upon, they will attack. They fight savagely and blindly, in the manner of mad dogs; they bare their teeth and leap about every which way, snarling and snapping and clawing the air. A full-grown black rat, when desperate, can jump three feet horizontally and make a vertical leap of two feet two inches, and a brown rat is nearly as spry. They are greatly feared by firemen. One of the hazards of fighting a fire in a junk shop or in an old warehouse is the crazed rats. It is dangerous to poke at them. They are able to run right up a cane or a broomstick and inflict deep, gashlike bits on their assailant’s hands. . . . Anyone who has been confronted by a rat in the bleakness of a Manhattan dawn and has seen it whirl and slink away, its claws rasping against the pavement, thereafter understand fully why this beast has been for centuries a symbol of the Judas and the stool pigeon, of soullessness in general. Veteran exterminators say that even they are unable to be calm around rats” (p. 491). Apparently, I should not have been so glib about my rat-sighting in New York City. I guess I was in real danger! I wish I could stay awake long enough to watch Fallon every night! If you love The New Yorker, you’ll like this. It is good stuff! Enjoyed the comment about “great books.” My students and I have been engaging in the “What makes a classic?” debate over the past few weeks … I might have to pick this up. Thanks! I hope you get a chance to read it. What does make a great book? I tend to think the canon is useful, but not inclusive enough, but I do appreciate the differences in “high” and “low” art. Both are important. What did your students say? I agree with you on the canon, as the books that it contains are certainly important; however, I too find that it isn’t, nor will it probably ever be, inclusive enough. My students, after much deliberation, have come to the following conclusions about “great books” or “classics”: They must have a message that resonates through time, be didactic (I think they read George Bernard Shaw last year as juniors), introduce a new literary style, and/or expand a reader’s perspective. Oh I have such a soft spot for James Spader (and The Blacklist is fantastic!) so this is one to keep an eye out for! You will have fun reading this just knowing that Spader recommended it! Downloaded. And probably going on my blog’s Christmas Gift Books list. And may I say it’s good to see you reading something pretty much for pleasure. An excellent way to celebrate your accomplishments! I’m assuming your bookshelf has a stack waiting to be read. But if you are looking for a novel and have not already done so, you might check out my Summer Reading List. There are a bunch of novels on it, from serious to light, and from long to (relatively) short. You read and write about the most interesting books that I wouldn’t think to pick up otherwise. This sounds so good, and, like the commenter above said, it’s good to see you reading for pleasure. 718 pages of pleasure! It was a lot of pages but definitely just for fun. I wish I had time to read a novel right now! I think Mitchell was as much a character as the ones he wrote about. He stood out even in the collection of brilliant eccentrics gathered at the New Yorker at the time. His reflections on the great tsunami of books enveloping bookstores may have contributed to what apparently was a crippling writer’s block in his later career. It is good that he did not see the rise of self publishing. He might never have put pen to paper. You’ve made me want to learn more about Mitchell other than what the dust jacket said about him. His passage about books was pretty funny, given how much more that is probably the case today. Self-publishing probably would’ve given him a heart attack! I kept thinking of the end of “1984” – whew. One of those rare treasures that just gets better with age. Thanks for recommending this book! Exactly. This book is a gem and a lovely look at the past! This book sounds kind of quirky and intriguing!